Science Fiction? Maybe, but the idea is intriguing! What’s the biggest problem facing the world’s food supply in 2050? With an anticipated 9 Billion people expected to be alive by then, the biggest problem to solve will be adequately feeding the swelling population. The constraint? Land to create farms is a fixed quantity. And concerns about the environmental impact of clearing more farm land causes a thinking person to pause. Once creative team has brainstormed a way to address these multiple concerns: by creating smart floating farm systems. Each module is anticipated to make 8,152 tons of vegetables every year and bring in 1,703 tons of fish. The modules, then, connect into a grid and can scale up into huge farms, producing local food for entire cities. 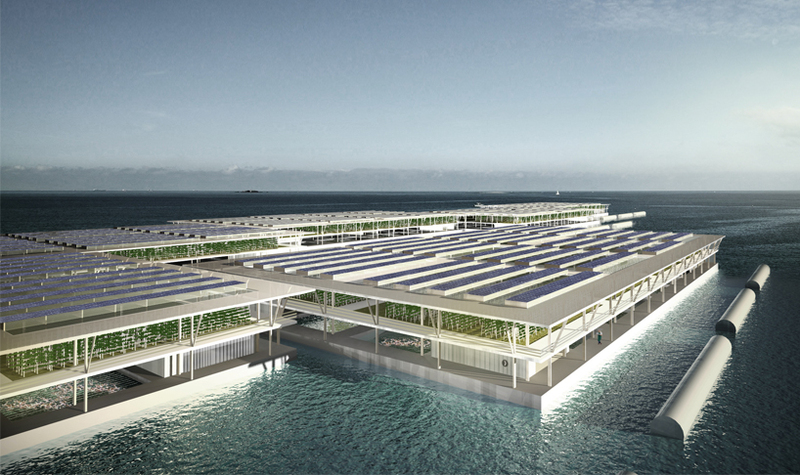 “We….conceptualized the ‘smart floating farm’ as a vision to the future of agribusiness. The concept is a commercially-viable off shore farming alternative, which would work in tandem with traditional growers to produce families with fresh, organic goods. the semi-automated, sustainable system will, they hope, drive communities towards healthier diets — the concept doesn’t include production of red meats or poultry; as well as decrease environmental destruction, and aid in food security and resilience. Give Nature Her Carbon Back! Here’s How!